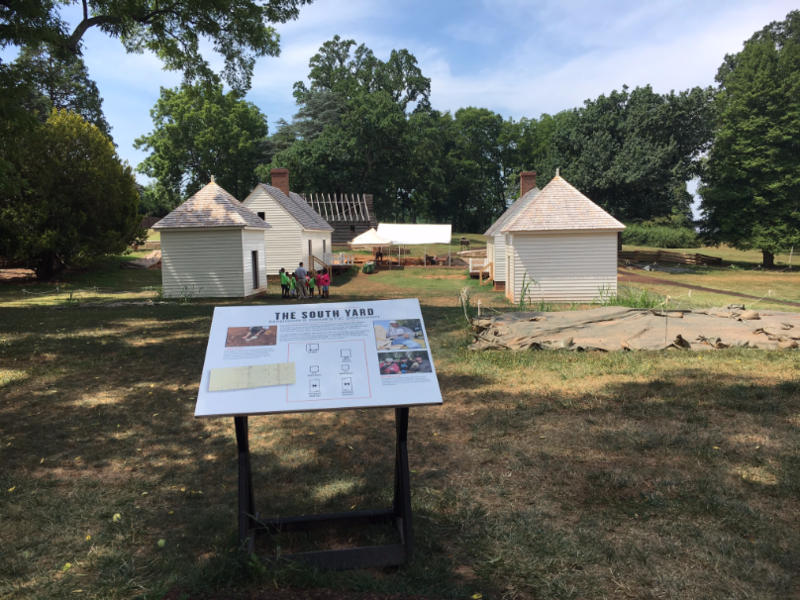 If you are heading to Charlottesville also check out Virginia’s Monticello– home of Thomas Jefferson! I have to be honest- I wasn’t expecting much from Montpelier. Having been so impressed with Virginia’s Monticello and the Mount Vernon Tours I figured this less famous house would be a quick stop over before heading back home. I could not have been more wrong. We spent six hours on the property and if it had been cooler we would have walked some of the 8 miles of hiking trails. A trip to Montpelier is an all day event worth your time, money and attention. The front of the property is beautiful- the land has been turned into a horse rehabilitation farm. Beautiful animals are running around the perfectly sculpted hills that make the drive in beautiful all by itself. 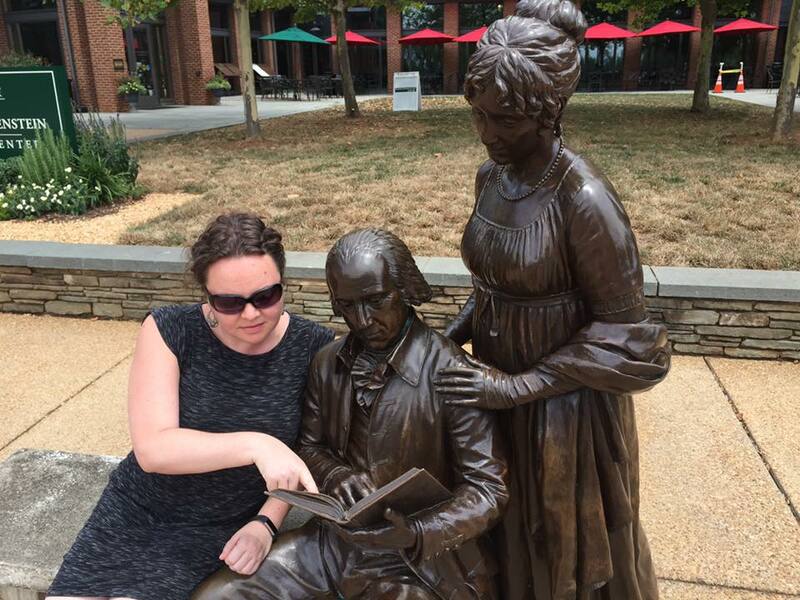 Hanging out with James and Dolley Madison. 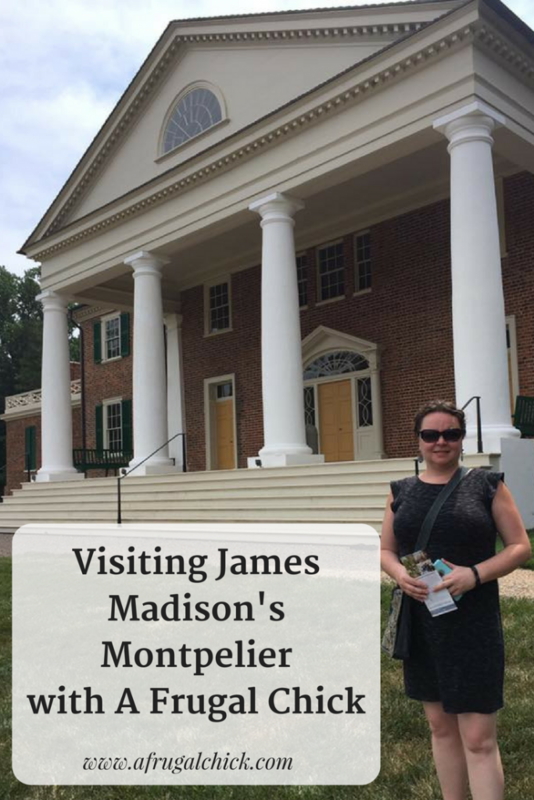 Unlike the other houses I have visited tours at Montpelier vary greatly. There are numerous types of house tours- each focusing in a different area. I think it actually makes things a bit more interesting. Each of these tours allows you access to everything I talk about in this post- all the grounds and exhibits are included in the ticket price. The Signature Tour is the normal house tour that covers a broad range of topics. Madison & The Constitution concentrates more on Madison’s ideology and his contributions to the Constitution. 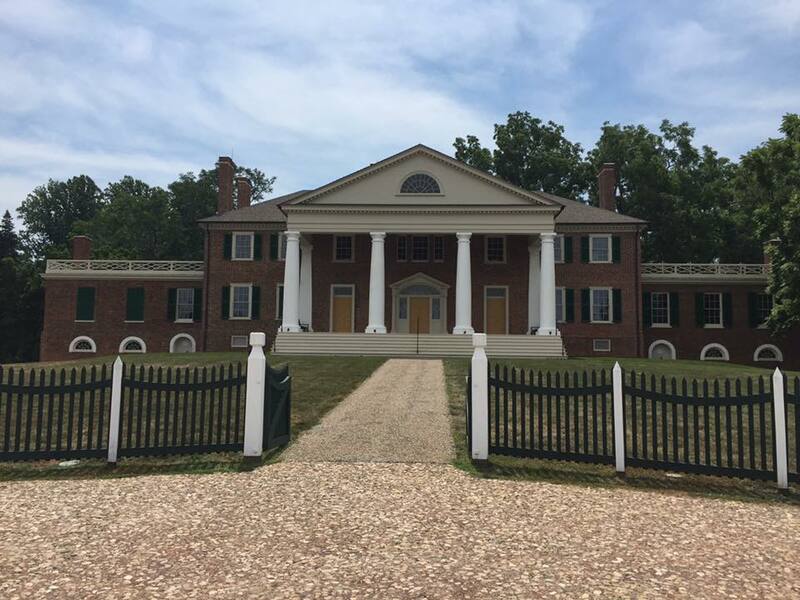 Dolley Madison & The Woman of Montpelier talks all about Dolley. Who is completely fascinating. 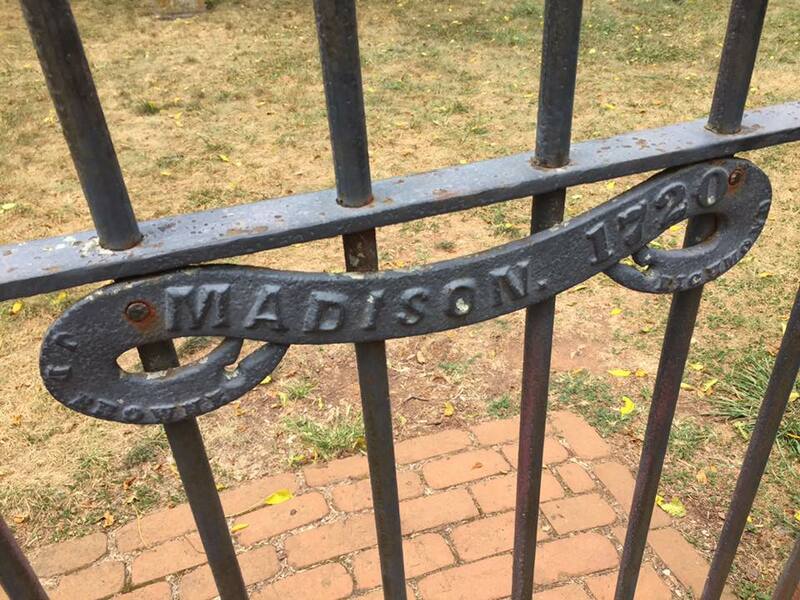 Discovering Montpelier: A Family-Friendly Tour is a hands on tour for children and families, documents, paintings and the House itself to learn about Montpelier, the Madisons and the enslaved community. And currently kids are FREE with the purchase of an adult tour (through September 5). After examining all the tours I really wanted to go on the Meet The Madisons tour. We were lucky enough we were going on a Thursday since the tour is only offered Thursday through Sunday at 9 a.m. The tour is more expensive but in our case it was completely worth it. Our host was Sara Lee and if there is any way to request her- DO IT. She was hilarious, knowledgeable and so excited to talk about the Madisons. The maximum number they will take on the tour is 8 people and Joel and I were lucky enough we were actually the only two. It really felt more like hanging out with Sara Lee talking about all the fascinating things. Since my year has included visits to Monticello and Mount Vernon and Joel was a political science major we were able to have some more in-depth discussions. You can’t take pictures inside the house and it drove me insane the whole time because I wanted to show you. The inside is amazing and the stories are even better. There is a mother-in-law suite (she was over 100 when she died so Dolley Madison’s Mother-in-Law was a huge player in the house) with one of the most intricate fireplaces I have ever seen. And it’s made of limestone- not wood. I can’t even imagine the work involved. Dolley Madison was an entertainer and her house showed it. The stories Sara Lee told about her dinner parties were hilarious. The Madisons had a slave, Paul Jennings, who attended these dinners. After he was freed he wrote a pamphlet with great details. I could write for several thousand words about what we learned on the tour but you need to take it yourself to get the full scope! The front door of the house is about the only thing you can take pictures of. A mirror door is on the back of the house. That way they could open both doors and have a breeze running through the house. 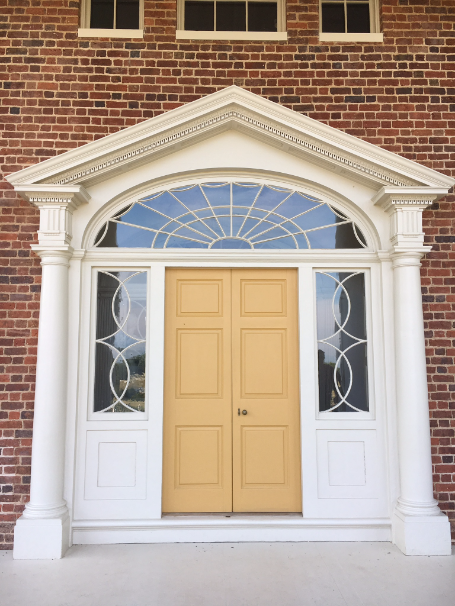 The windows on the side were designed by Jefferson. The door color (and this is perhaps one of my favorite details in the whole house) were actually PRIMER. They primed all the doors and Madison thought it was a waste of paint to do them again. So they remained the color of the primer. Montpelier is an active archaeological site. They are currently digging in the South Yard to find the exact fence line between the slave quarters and the field. 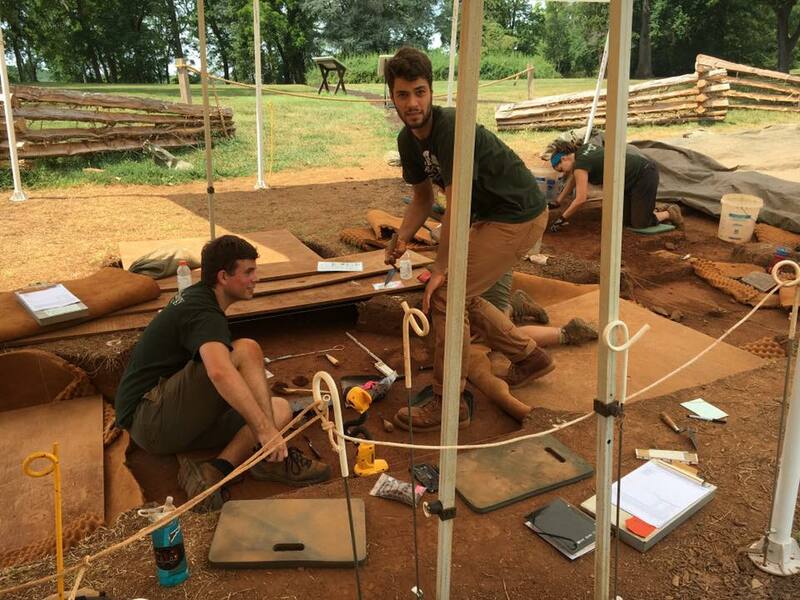 Also on the property is an Archaeology Lab with working students. You can go in and see the artifacts, watch them work and they will answer questions. This poor guy answered all our questions and I got the most awkward picture of him probably ever taken. Inside the Archaeology Lab we got to watch them work. The detail and patience they showed was unbelievable. 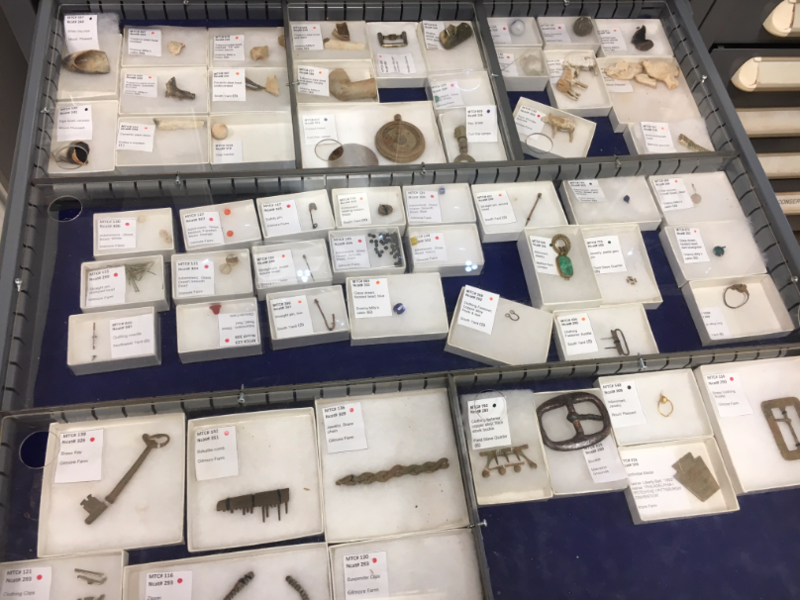 They have drawers full of artifacts you can open and examine. 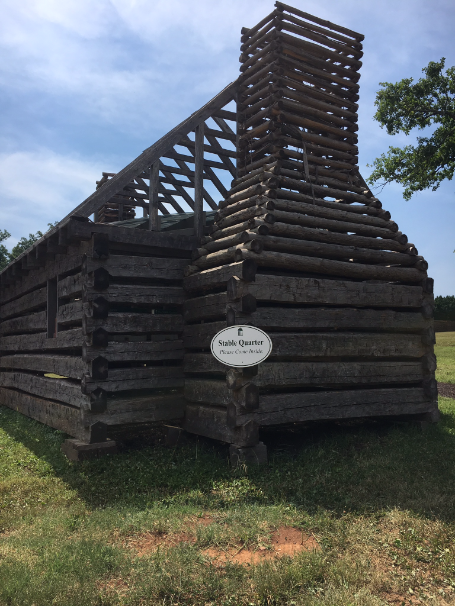 Because civil war activities also occurred on the property there are artifacts from many time periods. The exhibition is located in the cellars of the Madison home and in the South Yard, adjacent to the house, where many of would have lived. 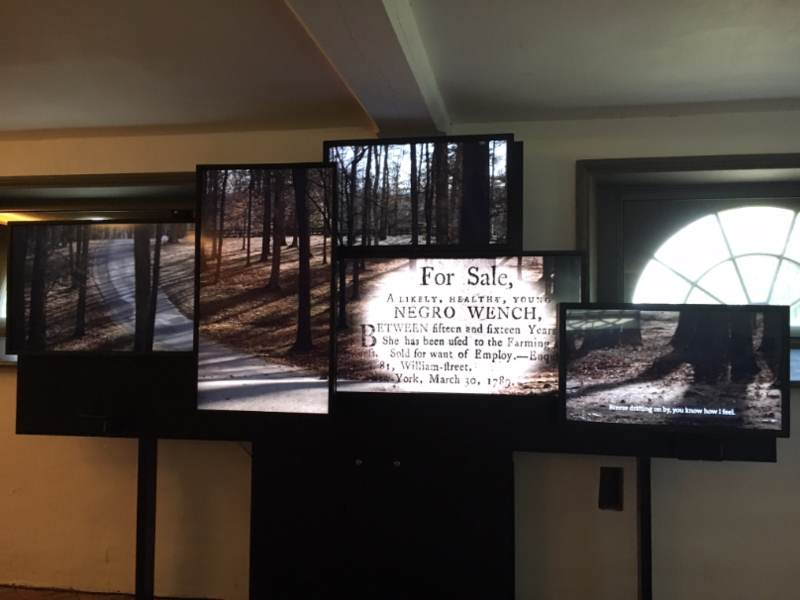 The Mere Distinction of Colour is the culmination of years of archaeological and historical research, resulting in a fact-based account of slavery’s influence on, and the contributions of the enslaved to, the founding of our country. 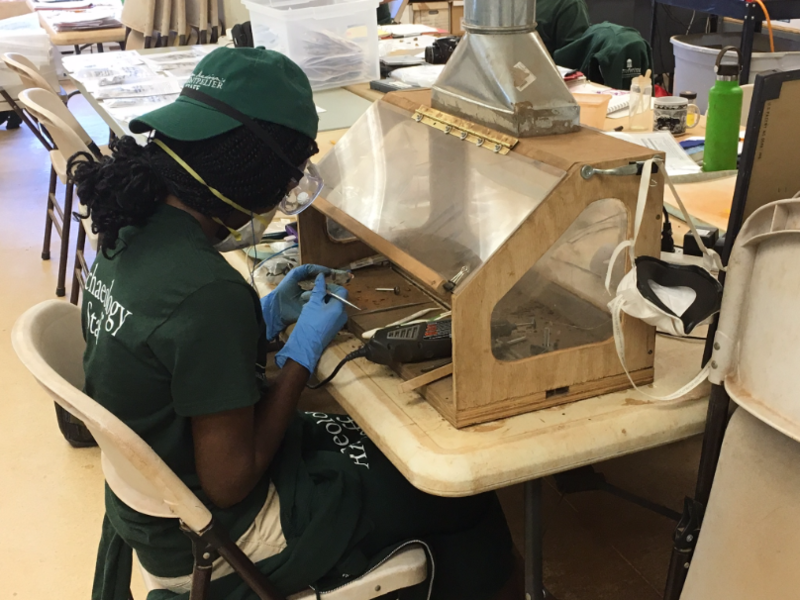 A recent financial gift allowed the estate to create this exhibit and it is certainly worth it’s weight in gold. Those front two white buildings are smoking houses (Dolley was known for her BBQ) and the back two are slave homes. Built just to the side of the South Yard is a sample Stable Quarter. This is what the houses would have been like for the slaves who worked in the fields. They would not have been built on the property in this current location but it makes for a much easier walk. You can go inside and examine it in detail. 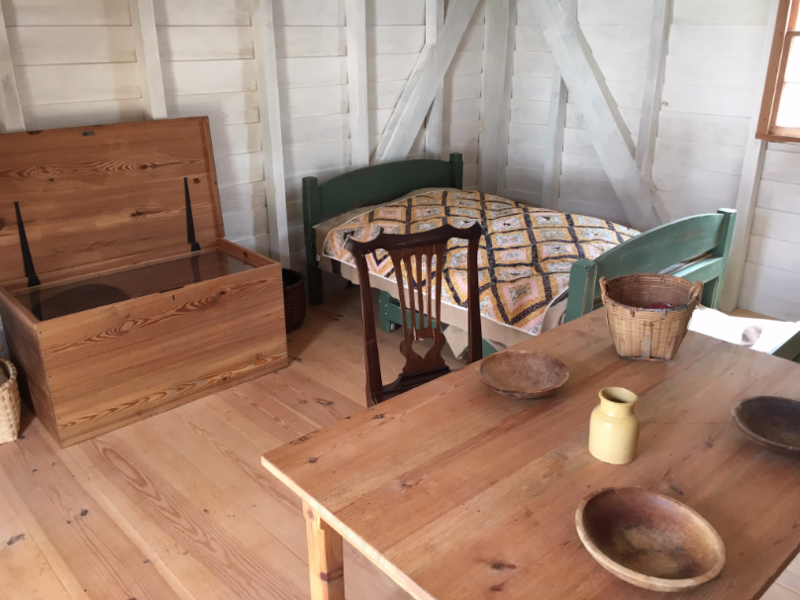 The slaves who lived near the house had better living quarters- though certainly nothing compared to the main house. Two cabins are built for you to examine inside and out. Underneath the house is the video portion of the display, along with statistics and other information- some of it really mind blowing. It’s a very quiet room with people respectfully moving from exhibit to exhibit. 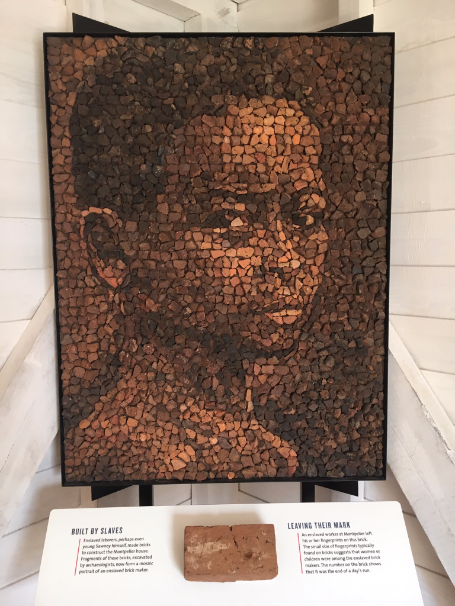 E Pluribus Unum is a mosaic created from pieces of brick excavated at living quarters of enslaved men, women and children across Montpelier. When they created and used bricks they would often put their finger prints in them- you can see some of the prints in this mosaic. The Exchange Cafe is location in the Rubenstein Visitor Center. While you can certainly pack a lunch and eat on the property (which would be more frugal) the food was incredible. We purchased both of the meals below plus bottles of water for $23. 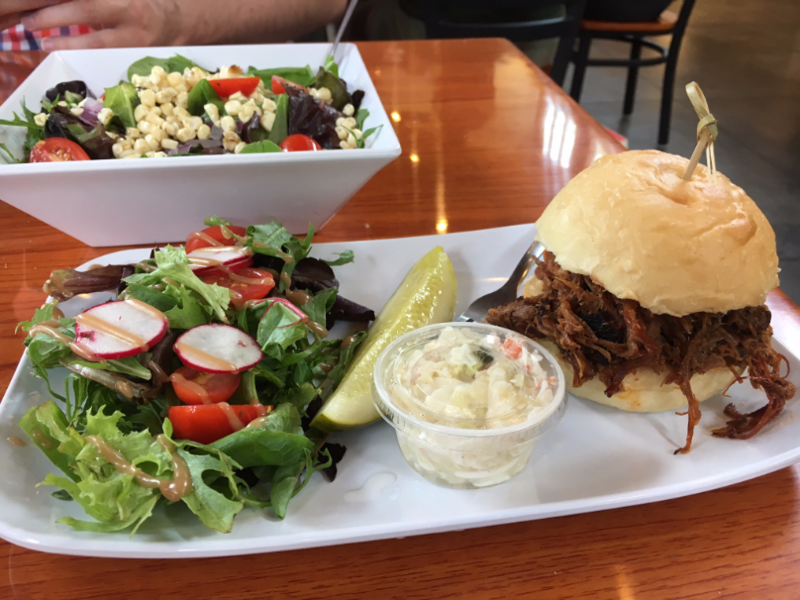 The summer spring salad and the BBQ platter were both incredibly good. 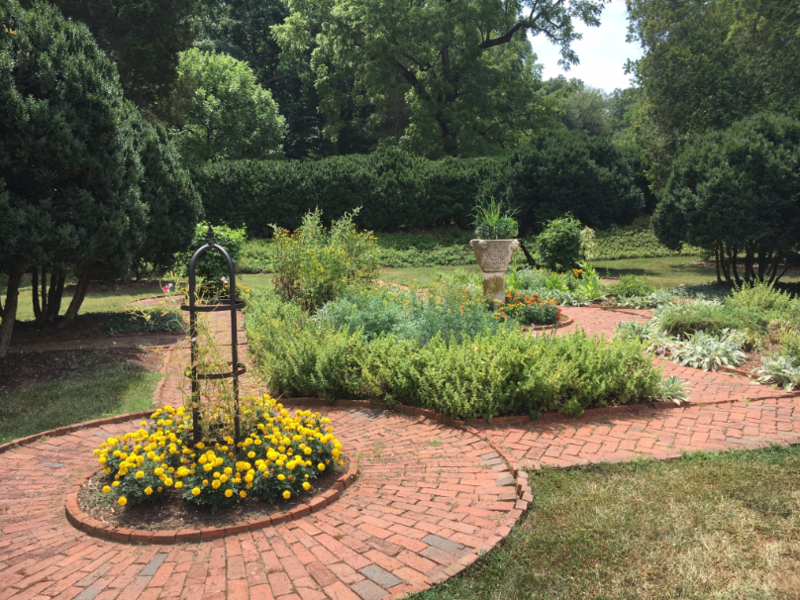 The Montpelier garden is only a short walk from the mansion. It is enclosed by a brick wall which was built by the DuPont family while they owned the property. Archaeological research has shown that the brick wall is in the same location as the fence put up by the Madisons- which was wooden. While the garden only houses flowers now it had plenty of fruits and vegetables when the Madison family lived there. And although they are not in the gardens there are BEAUTIFUL giant oak trees on the property- they provided nice shade. 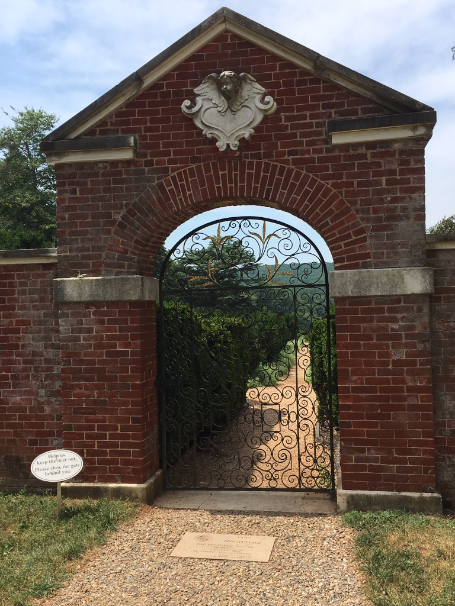 The beautiful garden gate was closed to keep out deer- you can feel free to open it and wander through! The gardens were stunning to walk through- even in July. I am sure they are even more beautiful during cooler months. 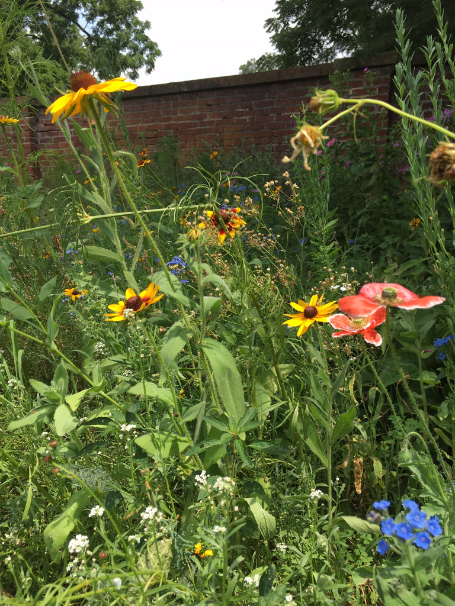 The wildflowers along the edge of the garden were lovely. 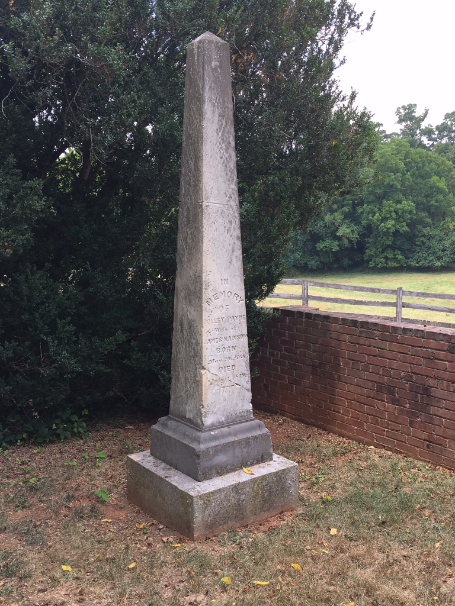 The Madison Family Cemetery is located just down the hill from the Visitor Center. It is a little bit of a walk but the scenery is beautiful. 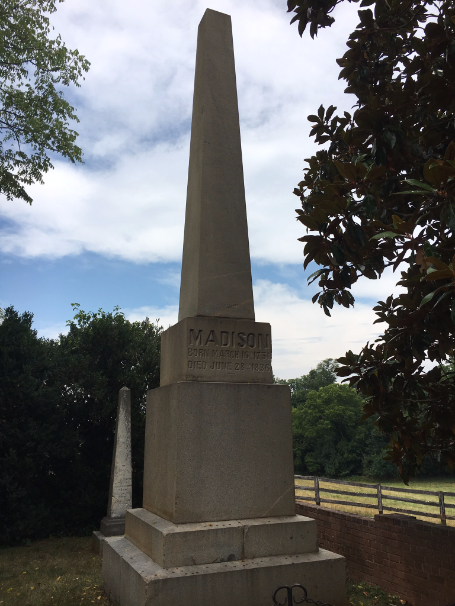 James and Dolly Madison are both buried there as well as family members up until the 1920’s. You can open the gate and actually go inside to see the tombstones. 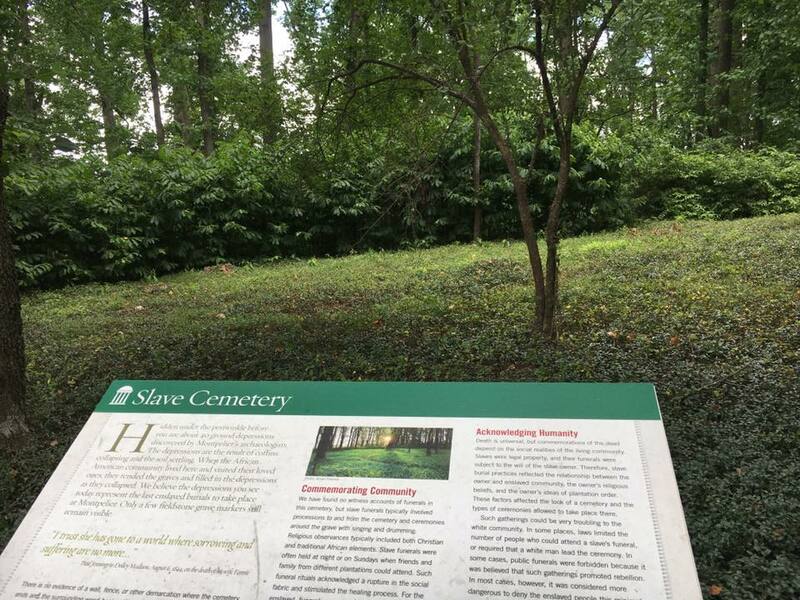 A little over .10 of a mile from the Madison Family Cemetery is the slave cemetery. It’s actually a very beautiful spot. This picture is in their materials (as it was 95 degrees the day we saw it there was no snow). 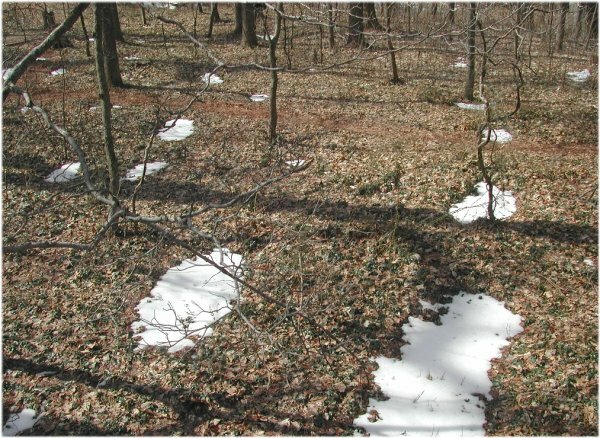 These are the only indicators of where the graves are. The spot is peaceful and the plaque is very moving. After all the other information from the exhibit it’s a sobering way to end the tour. I could write another 5,000 words about the visit. If you are considering a trip to Charlottesville, VA you MUST go to Montpelier. It’s a trip worth taking! So much to see right here in Virginia.